Photo Submitted by Crystal Ritz Fourteen pies were entered in Boone Creek Baptist Church’s March 31 Men’s Pie Bake Competition. Last year’s competition was a cake bake won by Curtis Ramsey, undefeated champion of this year’s pie bake. 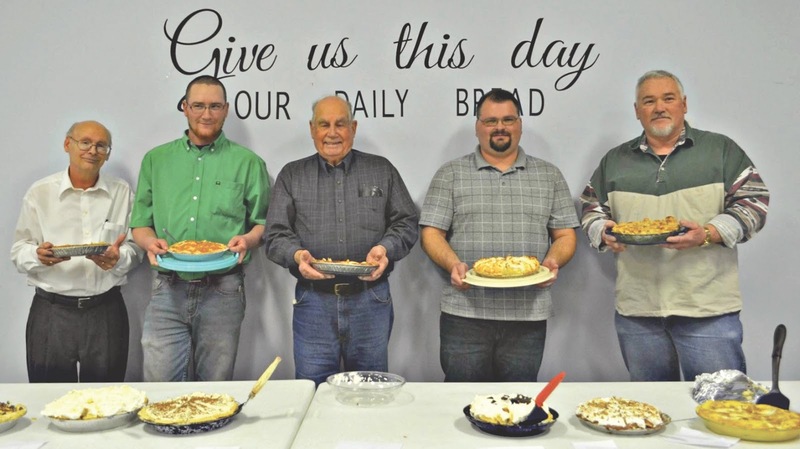 Pictured from left: Pastor Wayne Carrigan, 5th place; Craig Ramsey, 4th place; Gerald Marion, 3rd place, with the first pie he’d every made; Joe Satterfield, 2nd place and Curtis Ramsey, 1st place. Photo Submitted by Crystal Ritz 12 contestants competed in the Men’s Pie Bake contest. Pictured from left: John Mitchell, Kenny Ramsey, Wilfred Grover, Colin Ramsey, Brad Richards, Pastor Wayne Carrigan, Kyle Smith, Robert Keller, Craig Ramsey, Gerald Marion, Joe Satterfield, Curtis Ramsey. A special thank you to this year’s judges (not pictured), Billie Decker, Darlene Reed and Carolyn Barnes.